SAN FRANCISCO — FRONTLINE, ProPublica, NYTimes.com, France’s Rue 89 and Storify were among the news and technology organizations that took top honors Saturday night at the 2012 Online Journalism Awards Banquet, which ended the Online News Association Conference. California Watch, the Tampa Bay Times and StateImpact Florida each won $2,500 and the Gannett Foundation Award for Innovative Investigative Journalism at the 13th annual awards dinner, sponsored by NBC News Digital. Entries for all awards were open to news produced for any digital device. Each winner of the six General Excellence Awards took home a $3,000 prize, courtesy of the Gannett Foundation. The Knight Award for Public Service, which went to the start-up Homicide Watch D.C., comes with a $5,000 prize from the John S. and James L. Knight Foundation. The winners in the Breaking News categories were WNYC for its coverage of Hurricane Irene and the Los Angeles Times for Occupy L.A. Launched in 2000, the OJAs are administered by the Online News Association, now in partnership with the University of Miami’s School of Communication, and are the only comprehensive set of journalism prizes honoring excellence in digital journalism, focusing on independent, community, nonprofit, major media and international news sites. SAN FRANCISCO — Six media innovation ventures that make it easier to access and use information on local communities, air quality, elections, demographics and more received a total of $2.22 million today as winners of the Knight News Challenge: Data, announced at the 2012 Online News Association Conference. We’re just days away from ONA12, the sold-out 2012 Online News Association Conference and Online Journalism Awards Banquet, Sept. 20-22, at the Hyatt Regency in San Francisco. Prepare for a packed schedule, beautiful California weather, unparalleled networking and — of course — the best in digital journalism. Below are a few details to help you make the most of your experience. For Android users, visit ona2012.sched.org/mobile and bookmark the desired page from your phone’s default browser. On your home screen, press and hold where you want the icon to save. From “Add to Home Screen,” select “Shortcuts.” Press “Bookmark,” and select the mobile app. While you’re there, check out all 140+ of our presenters, also posted on the ONA12 sched.org site. Grab your badge and bag at the registration desk in the Hyatt’s Regency Room, starting Thursday, Friday and Saturday at 7:30 a.m. each day. Important note: Full conference badges are required for entry into all ONA12 meals, sessions and special events. Like to see who’s attending? If you’re planning to come to the Online Journalism Awards Banquet, please check your email for a 30-second survey from us. Take the survey and the attendee list is yours. Join us at the Opening Night Reception Thursday, Sept. 20, 7:30 p.m., at the historic Rincon Center, for an evening of geek delight, sponsored by NPR and Digital First Media. Bring your badge — you do need to be registered as a full-pass attendee. Map it here. Note: Enter at Spear Street, between Mission and Howard; all other entrances will be closed. If you’re unable to make it to the hotel to pick up your general pass before the opening night reception, volunteers will be able to check a list on site to let you in. You’ll find a colorful Stanford University-designed tee in each conference bag, and vintage conference tees will be available for $5 at a table near the registration desk. On Friday, Sept. 21, from 2:15-3:15 p.m., nearly all 15 candidates for the ONA Board of Directors will take the stage in Bayview AB to talk digital media issues, offer their vision for our organization, and take questions and tweets from the audience. Can’t make it to San Francisco? We’ll be livestreaming. Tweet your questions using the hashtag #ONAdecision, and Tweet Curator Steve Buttry will do his best to make sure they get asked. Join your colleagues and ONA Local chairs for community get-togethers from 4:45-6 p.m. on Saturday, Sept. 22, in the Hospitality Room (Atrium level). (There’s a rumor that beer will be had.) Come hear about ONA’s open-source approach to community building at one mighty meetup. Immediately following will be an ONA Local happy hour. ONA Social Media Maven Jen Mizgata once again will be acting as control tower on the @ONAConf Twitter account, directing you to session rooms and pointing you to discussions of note. The conference hashtag is #ONA12. If you plan to blog, vlog or otherwise report out, let Jen know by sending tweeting links to @ONAConf. Even a program as packed as ONA’s can leave something out. The ONA unconference is here to fill the gaps, created and hosted by you, the attendee, and we have four spots to fill on Saturday. You can submit sessions at ONA Unconference until the end of the Opening Night Reception Thursday, Sept. 20. We’ll post a voting form to the page the evening of Thursday, Sept. 20, and keep it open until Friday, Sept. 21, at 5 p.m. Winners will be announced before the Friday Night Keynote. Submit your session today! ONASF Welcome: On Wednesday, Sept. 19, at 7 p.m., come kick off ONA12 with our Local group with a party sponsored by PBS MediaShift and CIR. Meet local journalists and discuss the projects created in the Tech Raking II design sprint. RSVP now so you can join us at Gallery 16, 501 3rd Street, San Francisco, CA 94107.
wjchat Social Journalism Meetup: For the second year running, the Social Journalism Facebook group and #wjchat Twitter chat will host a Friday night social gathering after the day’s official ONA events conclude. RSVP now and join us at Sens Restaurant, 4 Embarcadero Center, San Francisco, CA 94111 (just across the street from the Hyatt Regency). SoundCloud and Storyful present News from Noise: Discuss how startups are helping savvy publishers get social and enjoy some drinks at SoundCloud HQ San Francisco, 510 Treat Avenue, San Francisco, 94110. RSVP on Eventbrite. ONA12 Karaoke: Return of the Sing: This year’s unofficial karaoke bash wil be held at Pandora Karaoke & Bar, 177 Eddy St., San Francisco, California 94102. RSVP on Facebook. We’re posting more details as we get them on journalists.org, so check back for more meetups. ONA12 will feature free wireless Internet access throughout the conference area, sponsored by ESPN. Look for the network ID: ONA12-ESPN. Bonus! Wireless access in guests room comes free. We’re just about a week away from the flurry of events around ONA12 — just in time for a few updates and surprises! NASA’s Jet Propulsion Laboratory leads the $2.5 billion Mars Science Laboratory mission, which dropped the 1-ton Curiosity rover on the Red Planet’s surface Aug. 5. The impressive social media team managed to explode the Internet, building 1.1 million Twitter followers for the mission. Join us for the Friday Night Networking Keynote with Veronica McGregor, News and Social Media Manager, and Stephanie Smith, Social Media Specialist, of the NASA Jet Propulsion Laboratory. They’ll share insight on how they managed their brand across YouTube, Twitter, Facebook, Ustream.tv and Google+ — plus some cool memes and videos from landing night. Looking for a chance to get your hands dirty with some new tools, dive deeper into current platforms and have your mind blown by the industry’s innovators? The Midway is jam-packed with excitement you won’t want to miss. 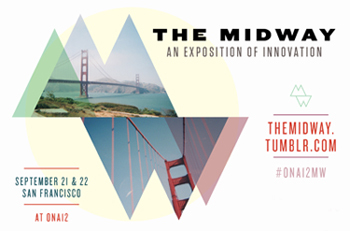 Follow theMidway.tumblr.com for details and look for us to roll out information on all Midway happenings throughout the next week. Get updates at the conference by following #ONA12MW on Twitter. Maybe a session you pitched earlier wasn’t selected for the official ONA12 schedule. Maybe you’re experiencing a newsroom debacle and want to brainstorm solutions with others. Maybe you have a model that works and you absolutely need to spread the word. The Unconference sessions give you the chance (and allotted room space and schedule times) to discuss the ideas that matter to you. Navigating legal issues in the digital media world can be frustratingly complex. To help, we’ve lined up a stellar mix of media lawyers, journalists and educators for a full-day course, Law School for Digital Journalists, Sept. 20 at the Hyatt Regency in San Francisco. Reporting, editing and posting within the cloud brings its own security and privacy risks, which are amplified for journalists. This high-level discussion will address freedom of speech and freedom of the press in a digital world. Get a guide to the legal questions that surround setting up and maintaining your media company. Get up to speed on branding, trademarks, and domain names; learn the dos and don’ts in advertising and email marketing; get familiar with the boundaries around behavioral advertising and privacy; and learn more about promotions and insurance coverage. Gannett, the New York Times and NPR are hiring! Join them and recruiters from other top media and tech companies and universities at the ONA12 Career Summit & Job Fair, Thursday, Sept. 20, at the San Francisco Hyatt Regency to find a job and hear about current openings. At the USA TODAY booth, visit with Gannett, USA TODAY and USATODAY.com recruiters to find out more about openings, such as a Web Editor in Detroit and .Net Web Developer. At The New York Times booth, learn more about the openings on the digital team, including Segment Video Producer and Interactive News Developer. NPR is hiring for positions in New York and Washington, D.C., including Streaming Media Manager and Correspondent/Host for Planet Money. Patch is hiring local editors in New Jersey, New York, Minnesota, Connecticut, Pennsylvania, Massachusetts and more. American Public Media, the Washington Post and other top companies with jobs also will be on hand to discuss career opportunities with you. We’re glad you’ll be joining us for the 2012 Online News Association Conference and Awards (ONA12) in San Francisco next month. As we’ve been getting ready for the conference, it’s come to our attention that some attendees and speakers are receiving messages from representatives from a labor union, Unite Here, about an ongoing labor dispute between the union and the Hyatt hotel chain. We wanted to give you some background, clear up any misunderstandings, and let you know, to the best of our ability, what to expect in San Francisco. Because of these unresolved issues, Unite Here has waged a campaign to urge travelers and meeting planners to boycott Hyatt Hotels. We were not made aware of the dispute by Unite Here or the hotel until 2012, a year after we signed our contract with the Hyatt Regency. Pulling out of a binding contract at that point would have been a six-figure cost — a non-starter for a nonprofit organization such as ours. As you know, we rely on the registration and sponsorships that come from our annual conference to provide member benefits and serve our journalism community. So while ONA is supportive of the ongoing negotiations process and has urged both parties to resolve their issues in a timely manner that is fair to all, we will hold our meeting as planned at the Hyatt Regency San Francisco from Sept. 20-22. Demonstrations ramped up in July, when a group of unions supported a global boycott of the Hyatt hotel chain. The Hyatt Regency staff is not on strike, nor — as far as we can know — are they expected to be, so ONA12 attendees will not be crossing a picket line, although there may be demonstrations. If that changes, we will let you know and offer conference refunds to anyone who feels uncomfortable with the situation by Sept. 12, according to our standard refund policy. At the conference itself, we will urge our media attendees and student newsroom to cover all sides of the issue as they see fit. Our organization is not alone in being approached by Unite Here. Other major membership associations holding their conferences at a Hyatt property, such as the Society for Prevention Research and the American College for Environmental and Occupational Medicine, have been contacted in the past as well. Other hotels targeted for boycotts are in San Francisco, Chicago and Honolulu. We’ve updated an FAQ we posted earlier this year with more information, located on the ONA12 website here. If you are an attendee or speaker with any questions or concerns, please feel free to get in touch with Executive Director Jane McDonnell at ona12@journalists.org. I look forward to seeing you in San Francisco. WASHINGTON, D.C. – Finalists for the 2012 Online Journalism Awards, many pushing the envelope of innovation and excellence in digital storytelling and distribution, were announced today by the Online News Association and its academic partner, the School of Communication at the University of Miami. A group of 34 industry-leading journalists and new media professionals teamed up to review entrants and select finalists. Twelve of those judges, representing a diverse cross-section of the industry, and 12 more internationally conferred to determine winners from independent, community, nonprofit, major media and international news sites. The results will be announced at the 2012 ONA Conference and Online Journalism Awards Banquet on Saturday, Sept. 22, in San Francisco. This year, ONA introduced category changes to ensure the awards maintain their innovative front edge by breaking out content by topic; categorizing entries by staff size rather than audience metrics, and assuming the use of the latest digital platforms and technologies. Eight awards come with a total of $33,000 in prize money, courtesy of the John S. and James L. Knight Foundation and the Gannett Foundation, which also is supporting innovative investigative work with two $2,500 awards. Thursday, Sept. 20, at the Hyatt Regency San Francisco: Get an intro to mobile reporting, learn to code, or tell stories with data in one of the nine Workshops before the official Online News Association Conference and Awards. ONA12 is now sold out, but we still have space in our hands-on workshops — you don’t have to be registered for ONA12 to attend. Law School For Digital Journalists: Immerse yourself in the legal challenges facing digital journalists in this course taught by leading media lawyers and journalism educators, including copyright, newsroom law, international media law, access and FOIA, and the legal issues involved in launching and running a digital news operation. Intro to Design Thinking: Join faculty and journalists from Stanford’s d.school and learn new ways to conceptualize stories and projects. Led by the staff of Stanford’s world-renowned Hasso M. Plattner Institute of Design — commonly called the d.school — and journalists who have trained there, this is a once-in-a-lifetime crash course in ideas and real-world experiences you can take back to energize your team. Introduction to Practical Programming: Learn one of the most desirable skills in the newsroom today: coding. Propublica’s Dan Nguyen and other leading coders will teach you basic programming concepts, how to write your first program and to write routines to handle some of your current tasks. Less than a month until ONA12! The clock is winding down for the Online News Association Conference and Awards, Sept. 20-22, and we’re gearing up for San Francisco, adding a world-class Stanford d.school Workshop and details on related parties. Are you a journalist, gamer, developer or designer interested in making news games more awesome? ONA is partnering with the Center for Investigative Reporting, IGN, and Public Radio International to bring you TechRaking II, the second conference in the TechRaking Series to explore the intersection of gaming technology and news. Join us for a full-day design sprint Wednesday, Sept. 19, in San Francisco. We’ll spend the morning exploring best practices in gaming the news and build together in the afternoon. For more information, check out CIR.org. For registration information, contact Kristin Crawford at kcrawford@cironline.org. This will be ONA’s first day of activities leading up to ONA12, followed by a full day of Thursday Workshops and Opening Night Reception, and the ONA12 general sessions Friday and Saturday. “Human-Centered Design” isn’t just about making good web pages, it’s a way of conceptualizing stories, projects and even your workspace. Toss in concepts of “show don’t tell,” “rapid prototyping” and “radical collaboration” and you’ve got Silicon Valley-style innovation jumpstarting your editorial and production process. This workshop will be led by staff of Stanford’s world-renowned Hasso M. Plattner Institute of Design — commonly called the d.school — and journalists who have trained there and will be a crash course in ideas and real-world experiences you can take back to energize your team. Join us Sept. 20 for this full-day workshop. Cost is $75 for ONA members and $100 for non-members.